Utne Reader was like the Velvet Underground of fanzines—not so popular but hugely influential. In Summer 1996, Paul Lukas, who was the first writer ever to cover Green, reviewed the magazine in Utne Reader, giving it the careful consideration its publishers had always wanted. 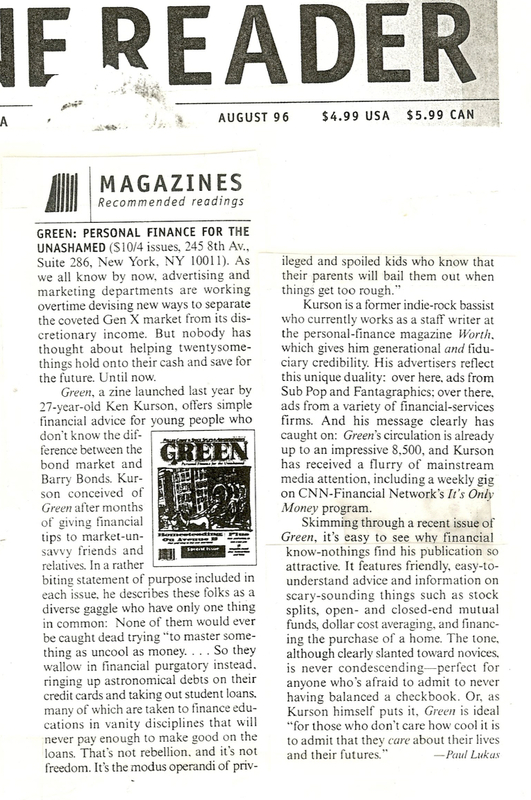 Lukas, himself the founder of punky fanzines that covered things other than music, was uniquely positioned to understand the aesthetic of Green and he nailed it in this clip, noting how ads from hipster brands Sub Pop and Fantagraphics were adjacent to those from Fidelity Investments.